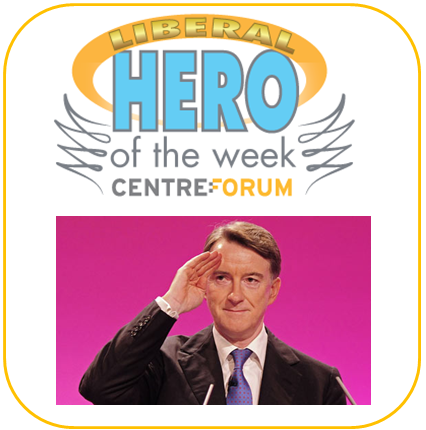 Three cheers for Peter Mandelson! That’s not a sentence I expected to type. But, then, much of the point of this series is to highlight acts of liberalism in unexpected places. Remember the context. We were emerging, or so we hoped, from the worst financial crisis of our lifetimes. We were on the eve of a general election and keen to paint an upbeat view of the future. Such publicly built infrastructure projects seemed to provide so much of the answer to our short and longer-term economic and employment needs. … We were focusing on the coming electoral battle, not on the detailed facts and figures of an investment that did not present us with any immediate spending choices. The vision was exciting, a lot of spadework had been done in the transport department and the cabinet adopted HS2 as a “national cause”, competing with the then Conservative leadership whose enthusiasm for the project had predated our own. HS2 is a huge, glitzy, overblown indulgence. It is especially beloved by that most dangerous breed of politician: the naive enthusiast who longs for a legacy project. Six months ago, when the Coalition announced its plans, I wrote an article for LibDemVoice highlighting some of the flaws in HS2: I apologise for my lack of enthusiasm for HS2. It’s been unavoidably delayed owing to the lack of evidence. HS2 has now become a faith-based project. Too many liberals/progressives hear the words ‘railways’ and ‘public investment’ and abandon any pretence of rational scepticism. All were based on the central assumption that if you could cut the travelling time between London, Birmingham, Manchester and Leeds, HS2 would transmit business and economic growth across the country, justifying the tens of billions of expenditure involved. This assumption was neither quantified nor proved. We are still waiting for independent analysis to support it. Meanwhile, alternatives – upgrading the east and west coast mainlines, major regional rail enhancements and mass transit projects in regions and provincial cities – were not actively considered. Lacking a credible business case, those who continue to cling to HS2 are reduced to ad hominem attacks on Peter Mandelson (Lib Dem transport minister Norman Baker’s catty quote failed to answer any of his critique) — or arguing that it’s an important gimmick needed to show that the state is capable of spending money (step forward The Independent’s normally excellent Steve Richards). This latter point struck me particularly because of another article written this week, by YouGov’s Peter Kellner in The Times (£), which highlighted how much less trust today’s voters have in the ability of the state to provide good quality public services: ‘millions of people across Europe despair of the State’s ability in practice to do any of these things effectively. The result is a widespread demand for smaller, smarter government.’ Little wonder when white elephants like HS2 are pushed forward not because they can be shown to be good policy, but simply to assert the government of the day’s macho stubbornness. As someone who spends a couple of hours each working day on trains, I’ve no problems arguing the case for government investment in the rail network. But let’s focus on the improvements that can be made affordably in the here and now and let lapse the pipedreams of here today, gone tomorrow politicians dazzled by the shiny and new. And thank you, Peter Mandelson, for waving a red flag to try and halt this locomotive before it steams ahead.